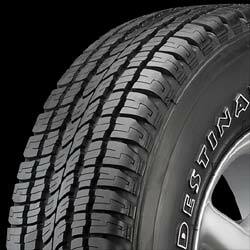 The Destination LE with UNI-T is Firestone's Highway All-Season tire developed to bring the benefits of UNI-T technology to sport utility vehicles, vans & light duty pickup trucks. It is designed to combine much of a passenger tire's quiet comfort with yea-round traction, even in light snow. On the outside, the Destination LE uses Firestone's Weathergrip tread compound enhanced with a special Long Link Carbon Black (L.L. Carbon) to boost wet traction while improving treadwear. This compound is molded into a symmetric tread design featuring independent blocks that use Firestone's 5 Degree Noise Reduction to generate noise-canceling sound waves to reduce overall tire noise. On the inside, the Destination LE features twin steel belts reinforced with spirally wrapped nylon to provide strength, uniformity & durability on top of a polyester cord body that helps cushion the ride. Destination LE Highway All-Season light truck tires feature outline white letter styling & are designed to fit many sport utility vehicles, vans & light duty pickup trucks. They are S-speed rated & are available in a wide range of 70- & 75-series P-metric sizes & selected LT-metric sizes to fit 14" through 17" diameter wheels. The Destination LE tire is also available with a R-speed rating (106 mph) in the popular 31x10.50R15LT Flotation size.